“Let’s Talk Beer Styles” is a monthly feature that accompanies Paste’s large-scale blind craft beer style tastings/rankings. The first month covered the history and modern role of American pale ale. This month, we’re covering black IPA, of which we just blind-tasted 21 examples. Almost every beer style familiar to the American craft beer drinker has hundreds of years of history and evolution behind it. Whether they’re pale ales stretching all the way back to the invention of precisely kilned malt in England or pilsners that date back to the soft water characteristics of their native Czech Republic, we’re talking about a matter of centuries. This holds true for almost any major beer style—but not for “black IPA.” This contentious style is a thoroughly American invention, at least as we’ve come to understand it, and a still-recent one at that. The type of beer typically labeled as “black IPA” in 2016 didn’t truly become common and codified on a national scale until roughly 2009 or 2010, making it a unique footnote in the history of American brewing. 2009 may have been the first year that beers labeled as “black IPA” began showing up with regularity on store shelves, but it was hardly the first time that significant breweries had produced hop-forward beers that happened to be black. Trying to nail down an absolute here is nebulous and probably pointless—the law of brewing averages suggests that at SOME point, there was probably a highly hopped British stock ale in 1800s England that also happened to be a few shades darker than usual. Let’s instead focus on the American market. Here in the U.S.A., most writers point toward the early ‘90s as the first period where anyone was regularly brewing beers that we would today identify as black IPAs. In particular, a beer produced by the late Greg Noonan, a well-known beer author and brewer for Vermont Pub and Brewery, is cited as perhaps the first well-documented example in 1992 or 1993. One has to wonder how the Vermont drinkers reacted to the seeming oxymoron of a dark, hop-forward beer at the time. Still, that would have been a taproom exclusive beer that was never packaged. The earliest packaged example I can find of what we would think of as black IPA wasn’t actually labeled as such—Avery Brewing Co.’s New World Porter, which was first produced in 1997. The “New World” name was a reference to its heavy dose of American hops, but it lacked the “black IPA” term because it simply hadn’t been coined yet. More recent releases of this seasonal Avery beer have even included the phrase “a pioneering black IPA” in reference to the fact that the brewery was essentially bottling a great example of the style before the style officially existed. 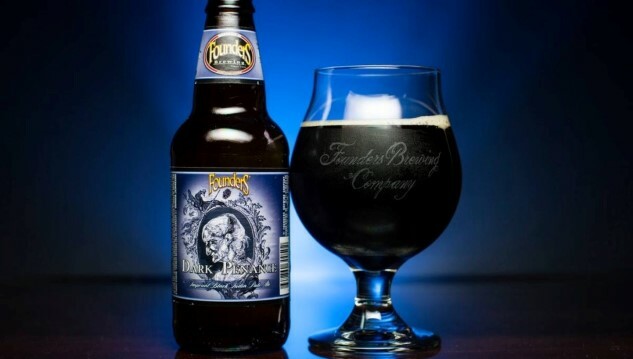 Other pioneering examples from larger regional breweries can include Dogfish Head’s Indian Brown Ale, first released in 1999, and Rogue’s Skull Splitter, a black version of their Brutal Bitter IPA, first released in 2003. Still, that’s a pretty long, slow acceptance period before the “black IPA” term flared into more universal existence at the end of the 2000s. Eventually, though, a general consensus developed on how the style is usually presented. ABV is moderate to high, with mild to moderate roastiness that is sometimes derived via debittered black malts such as Carafa, lending a crisper edge and the type of dry, coffee-like flavor you find in the German black lager style, schwarzbier. Hop presence runs the gamut from mild to intense depending on the source, and likewise can represent any family of hop flavors, although the Pacific Northwest combo of pine and citrus is probably the most common. The style has at least developed enough to have a pretty good idea of what any given black IPA might taste like. The only problem—no one could decide on what the style’s name should actually be. No American craft beer style has ever generated more contentious debate than black IPA, when it comes to nomenclature. From the moment that people starting calling this style anything, there’s never been consensus on what exactly they should be called. The most common label is of course the one I’ve been using all throughout this article—“black IPA.” It’s a simple descriptor that recognizes the style as a twist on the existing style of American IPA—it’s an India pale ale, except black. The oxymoron, of course, is that this results in the beer being described as both “pale” and “black” within one phrase, which is less than desirable for “these names need to make sense” purists. That argument is at the root of most of the other titles that have been advocated for, from “India black ale” to “American-style black ale,” which is the term currently used by judging organizations such as the BJCP and user rating sites such as Beer Advocate. Of course, as Stone’s Greg Koch points out in this well-written piece, those titles have just as many problems, from the use of “India” to mean hoppy, 300 years after that word had any actual significance in the brewing world, to the similar use of “American” to automatically convey the idea of hops. Obviously, as in the case of American-style wheat beer, this isn’t the case. Those who advocate for “India black ale” or “American-style black ale” because black IPA “doesn’t make sense” simply choose not to acknowledge that the alternatives are no more logical. And then there’s “Cascadian dark ale,” the most niche of the alternative black IPA titles, and one that you only really see advocated for by people who live in the Northwest. It has its defenders, but I’ll be frank: I dislike this title. It’s incorrect on most levels, first by implying that the style originates in the Cascade Mountains, when we’ve already addressed that the first verified version was from Vermont. It’s also more confusing to the consumer—do you really think that a drinker in Florida has any idea what “Cascadian dark ale” means? It’s ironic that proponents of this title will call “black IPA” confusing because of its oxymoron but not acknowledge that an obscure regional reference is asking far more of an average drinker to understand. Of course, at this point that debate is mostly academic … or historical, brief as that history may be. If there ever was any question of what the style’s ultimate name would be, it’s clear in 2016 that “black IPA” is the winner. Despite the efforts of breweries, beer organizations and those with influence in the industry, none of the other names have stuck. The Great American Beer Fest can continue to call its category “American-style black ale,” but how many beers do you see on the shelves of your package store labeled as such? In the end, it’s the consumers who decide, and they’ve roundly ignored other names and continued to simply call this style black IPA. And that’s undoubtedly how it will remain. In terms of its current role in the American craft beer market, black IPA seems to be in a bit of a weird position. Six to seven years ago, the style had just come into the vogue, and was springing up at seemingly every hop-forward brewery overnight. We all know how faddish the craft beer industry can be, whether it’s a new style or a new hop variety that springs into popularity (2016: The year of Vic Secret?). We saw it in the last few years with the sudden adoption of American-style gose, to note a more recent example. But with black IPA, the initial flare seems to have reduced to a more niche appreciation. Since that initial boom, we’ve seen some of those black IPAs ebb away, for a variety of reasons. For one, although a well-executed black IPA can be a thing of beauty, they’ve seemingly never turned into a particularly hot-selling style. Ask a professional brewer or package store owner about black IPAs and they’ll be happy to tell you that all too often they end up sitting on the shelf. Perhaps it has something to do with seasonality, and the fact that no one season is specifically associated with black IPAs, many of which are seasonal or limited releases. By extension, we can also extrapolate that although many drinkers appreciate black IPA, it is almost never anyone’s “favorite style.” Even its ratings are universally lower on the big beer rating sites. You can see it for yourself when you compare the top 100 rated American IPAs to the top 100 black IPAs via a site like BeerAdvocate. The top IPAs are so much higher rated on average that Firestone Walker’s Wookey Jack (the #3 black IPA in the world, according to BA), is the only regularly produced black IPA in the world that would find a place on the top 100 American IPAs list. It also explains why there are essentially no “whales” in the black IPA style—they simply don’t have a ton of value as trade bait, in the eyes of the most voracious beer geeks. Still, I’m certainly willing to go to bat for a good black IPA. As our own blind tasting just showed, it’s a style more limited in total numbers, but one where the average entrant was coming from breweries we liked and respect. It says a lot that in a tasting of only 21 beers, there were offerings from Firestone Walker, Maine Beer Co., The Brew Kettle, Stone, Founders and more. This seasonally released porter dates back to 1997, and it might very well be the first beer I ever sampled that I’d later come to think of as a black IPA. I remember drinking one during my initial craft beer exploration phase in a central Illinois bar and enjoying the solid cocoa and caramel flavors I expected from a porter … but then, what’s this? Why is my porter also this grassy and citrusy? I’d never even heard the phrase “black IPA” yet, so I had no point of reference, and apparently the brewery didn’t either. One gets the sense that if the same beer was crafted for the first time today, they simply would have called it a black IPA, given that in recent years the label has born the phrase “a pioneering black IPA” in small print. Regardless, it remains a historical touchstone of the style. Wookey Jack is close to a modern template of where the black IPA style has gone since its inception. Turning the wheel a bit more in the direction of “IPA” than “black,” it packs a good charge of green, resinous and citric hops that you expect from the West Coast. When you ask a craft beer geek to describe what a black IPA would taste like, the flavor profile of Wookey Jack is one of the best illustrations available. The black variant of Stone’s regular Enjoy By IPA may very well be a window of where black IPA is going as it continues to evolve. Extremely hop-forward, and reflective of current trends in IPA that favor fruitier, juicier hop profiles, it’s awash with tropical flavors, while still managing to maintain a little bit of roastiness and drink way, way easier than it should, given the ABV. In a style where there can sometimes seem to be a lack of variation, Enjoy By Black shows that there’s still plenty of room to break away and explore new ground. Jim Vorel is Paste’s news editor, and he’s looking forward to the next two entries: Belgian quad and classic pilsner. You can follow him on Twitter.